Our last day of LRTT sessions on Thursday went down well. I spent the morning running a session with Alex then we squeezed in a reflection session before lunch where we all wrote a postcard of promises for what we would add to our teaching in the following year. Our teachers walked down to Great Lakes College for lunch and to have the graduation ceremony. This time Simon’s speech was timely- he was trying to talk about teachers as rainmakers again but only the front rows could hear him as the tin roof loudly battled with the rain to keep it out. We took it in turns to go and stand at the front and shake the hands of our teachers after they had been given their certificates by the region’s education minister. After all the certificates had been handed out and we’d said our goodbyes to the teachers, most of the Teach Firsters went to Kanungu to pick up their ridiculous tailored African clothes, whilst I ran home with Ed. The run was great as it had just started raining so the temperature was do-able. I got back then headed down to the mud football pitch with a few other guys. We were hoping to play some Ugandan teachers but they didn’t show up so we a 6 vs. 6 match instead. That evening consisted of a judge vs. jury game where we put convictions in a box to be read out by Pete (the judge) then the punishment decided by the birthday girls (Claire and Krishna). The convictions were all about the trip’s antics so were hilarious with the worst being long showers or my horrific bout of food poisoning on safari. On Friday morning, we said our final farewells to the lodge then piled into three mini-buses for the trip back to Kampala. Thankfully the journey was only 11 hours compared to the 20 hour marathon on the way down. The buses arrived at Backpackers at 9pm so we wolfed down some pizza, had a warm shower (wow) then headed to a club in town. Dangerously, we hit a casino in the early hours. This was my first casino experience and I somehow left without losing any money and gaining free food and drinks at the tables. Tim and Simon were less lucky. They both had a similar game plan of starting with 100,000 shillings, winning three times that amount then putting it all on red and losing the lot. On Saturday, we hit the touristy craft market and everyone bought a load of tat. I thought I would ask about ivory and was offered an ivory necklace from the first stall I went to which was pretty scary. The evening got quite emotional- we were sad to be leaving and incredibly tired from the journey and night out in Kampala. Most people were on a four AM flight on Sunday morning whereas I had a four AM flight on the Monday morning. We decided to spend the last night as a big group at an open air restaurant eating very good curry. I felt sorry for the people down the end who didn’t get much curry but it just tasted so good. There was a live band so Liz and I whipped out the salsa but nobody joined us so it was just a bit embarrassing. Just before the end, the whole group got up (probably encouraged by our dancing) and we had a karaoke session of the songs of the trip- “Making melodies,” “Lean on me” et al. There was a big round of hugs then everyone departed for the airport. About ten of us were left so went to a cool open-air shisha bar called Mish Mash. There was lots more dancing in here before Pete and I dangerously went onto another club. I don’t remember the name of this one but we witnessed a huge fight where one giant of a man smashed a bar stool over another guy’s head. On Sunday, I sat around chatting with Joyce who is working on the initial stages of an enterprise project with VU. The others were out watching football so we had something to eat before going to join them. The worst part about joining them was the ride to the place on the back of the boda bodas (motorbike taxis). These things don’t go very fast but have the least right-of-way on the roads compared to the other vehicles. You’ll be happy to hear that we survived and fit three people on one bike at the same time so it was very economical. We were completely squished onto his bike and were grabbing onto anything to feel a bit safer whilst tearing through the streets of Kampala. It was a very scary trip but I started to get used to it by the end. We met the others in a bar/restaurant where a big wedding was about to start. They had tucked us away outside to avoid causing trouble but Simon and I couldn’t resist a quick walk down the aisle. We had a crazy dinner that evening. The next set of volunteers joined us and we split into four groups. Each group had its own cooking equipment, type of meat, fresh ingredients and lots of spices. We all cooked up our curries then judged the winner. Sadly, our cheeky addition of Nile beer didn’t help but the food was pretty good. This time it was me saying the goodbyes and a massive thank you to Simon for inviting me. I went to the backpackers, collected my stuff then jumped in a taxi to the airport. The flight to Cairo was good, lots of sleep and leg-room to expand into. I arrived in Cairo at about 0830. The Sun was already baking and burn-potential was high even within ten minutes. I minced around for about an hour trying to sort a visa for entry into Egypt as my stop-over was about seven hours. After all the bureaucracy, I was quite chuffed with the big Egypt sticker in my passport. I headed out of the airport and straight into the palms of all the hustlers who wanted to take me on tours of the pyramids. I managed to secure a deal with a guy to take me to the National museum and back for 170 Egyptian dollars. Soon after, I realised that this guy was just the confident, friendly, English-speaking fixer for his harem of taxi drivers. I went with one guy called Termil. We were introduced and sized each other up; me thinking “I could probably take him on if he tried anything,” him thinking “Just another tourist looking for a genuine Egyptian experience.” Termil spoke very little English and had a favourite phrase of “The pyramids are good, very very good.” Slightly annoying considering I didn’t want to go to the pyramids. The drive was scarier than the boda boda in Kampala- Egyptians in Cairo drive like idiots in a car park moving at 70mph. After an hour of the recklessness, we parked up by Tahir Square and made our way to the museum. I opted for a guide thinking that wandering aimlessly round this place with Termil would be ridiculous. The guide, Osama, was great. Really friendly and filled with detailed information about the ancient Egyptian artefacts. The gold and ivory-plated tombs and jewellery from Tutankamun’s discovery were the most impressive things along with clothes from 3,362 years ago that had still managed to stay intact. There were some ornate gold jewels and papyrus scriptures worth $60 million US per piece. This entry was posted in Uncategorized on January 9, 2013 by tomgreenwood1. This week we have been teaching 180 secondary school teacher. In general, they have higher qualifications and seem to be brighter than the primary school teachers last week. The only problem is that they are quieter and less engaged. There is the common challenge of them walking out and talking over you that we faced last week and dealing with it is very difficult. It’s hard to ask a head teacher to stop talking! After the sessions yesterday, a few of us ran home from the schools. When we got back to the lodge we took a football down the road to play a match on a clay pitch. A couple of kids came along to join in and we had a great game. We arrived back to the lodge to a big dinner of potatoes and meat stew (possibly beef, probably goat). As dinner finished we got into our teaching pairs for the next day and planned the sessions before sunset. I’ve really enjoyed planning and teaching with the other Teach Firsters. It’s nice to plan an activity and not have to worry about keeping a lid on behaviour. In the lodge, they have set up a big bed sheet hanging from an archway so the Lion King was projected onto that and Alex had a great time singing along to every word even if his dulcet tone rings around the room like a bored, exasperated panda. There was not much to do after the movie so a new sport was created; slam dunk rubbish basketball. This morning, I got up early to do some hand-washing and grate the skin off my fingers with soap suds. The worst thing about hand-washing is that your clothes never get clean even if you wash them ten times with all your effort. Breakfast was the same as normal but a same-as-normal that is lovely; sweet pineapple, bananas and bread, all of which can be covered in maple syrup. We all eat as much as we can at breakfast to try to save ourselves and avoid the dreaded school lunch. Frustratingly, our bus to school was late today so we only got there at 10AM (meant to start at 09.45). After apologising profusely to the teachers who had been waiting for us, Alex and I ran two sessions on questioning strategies that went really well, apart from one of the activities. We had a very difficult game of 20 questions that took about 15 minutes to explain and even then they thought Osama Bin Laden was a Ugandan business women, which kind of ruins the game. I polished off a rolex at lunch then found out that we would have dwindling numbers in the afternoon sessions. Lots of the teachers had to go to a funeral and funerals are law in Uganda so there are fines for not going. This entry was posted in Uncategorized on November 25, 2012 by tomgreenwood1. Liz and Morag’s birthday party was incredible- Dave organised a talent show where the two birthday girls were judges. Dave and I did a crazy dance to Azealia Banks- 212, there was beat boxing from Micah, classical singing from Daisy and a rap from Beth and her posse. The next morning we set out on safari to Queen Elizabeth National Park. The whole group piled into three Toyota Hiaces with converted safari roofs so we could poke our heads out and sit on top. A couple of us sat on the front for the first drive through the park until we realised that this was ridiculously dangerous- our feet were hanging down in the driver’s view and one slip could have made us tasty road kill. It was such a surreal experience with wind blasting through our hair and dust in our eyes as we tried to keep them open to spot Ugandan cobs, red topis and other gazelle-ish creatures. The buses arrived at the campsite, aptly named Wilderness Camp, in the afternoon. We spent Friday night setting up tents, singing camp-fire songs and watching silhouettes of five metre-long hippos walking through the river a stones throw from the tents. On the other side of the river was the “Democratic” Republic of Congo; another dangerous campsite feature. The first safari trip set off early the next morning. By seven AM, we were on the road watching elephants, water buffalo, more cobs and red topis. The afternoon was just as epic- a boat safari along Lake Edward up to Lake George. This time, hippos, crocodiles and giant birds were everywhere. We saw two African fish Eagles and numerous stalks and herons. Finally, the day ended with a drive to a new campsite on top of a hill that overlooked Lake Edward. The site was part of a larger resort that included a plush hotel with all-you-can-eat buffet. The buffet was great, it even had steak and kidney pie, but the incessant flies put the Damien Hirst gallery in the Tate Modern to shame. Outside the window there were swarms of them and they made a thick carpet of writhing detritus when they landed on the floor. Yet again, Sunday came through like a punch in the face with another incredibly early start. We set off so early in a bid to spot these elusive tree-climbing lions we had heard about. Our luck came through early on and we sat on/in the vans for 40 minutes watching a pride of lions lounging on the grass about 50 metres away. There were three cubs, two females and one huge male who looked spectacular through binoculars. After the lions, we drove to a salty volcanic crater lake then made our way back to the camp for lunch. I could have sat watching those lions for hours but people started reading their books so we knew it was time to go. Incredibly, after a morning of seeing lions, the afternoon got even better. Ten of us got in one van that left immediately after lunch to set off on chimpanzee tracking! We arrived at a 100 metre deep gorge and enjoyed the views for a couple of hours whilst waiting for our trackers. In classical Ugandan style, the tracker turned up with an AK-47 and a penchant for ripping really dry jokes to take the piss of the tourists. The tracking started with a walk down to the bottom of the gorge to a river that runs through it. The jungle in this gorge was as dense as it was in the Amazon and the trail we were following was full of hazards to cause trouble to any booby traps in the group. There was so much diversity down here compared to the surrounding savannah and there was an overwhelming sense of much more exciting things all around us. The first of these were colobus monkeys; a good sign for us as they are chimpanzee fodder! Then, as we were walking along the river, a family of hippos emerged from the water with a loud grunt. They weren’t too happy with us disturbing them. The tracking then became really interesting as the guide was finding old chimp nests, knuckle prints and fresh food remnants. Our first sighting was epic; a big male stood on a branch looking so human-like in terms of its size and proportions. We all scrambled around the undergrowth trying to get a better view then the group became unsettled. They started to drop down the trees and once on the floor ran away from us following the big male. Within seconds they were out of site and I was absolutely lost as to where they had gone. Thankfully the guide was on the ball and made off after them. We obviously followed as fast as we could. Our next sighting was the single best thing I have ever seen. The guide stopped on top of a hill and pointed our gazes towards the canopy across from us. The views here were as good as before but we could see so many individuals in the trees. At this point our guide seemed satisfied with his performance and thought the tracking was over. He had “tracked” the chimps for us but I wanted to meet them. I asked if I could venture down the hill to get a bit closer. As soon as he agreed, I was off, jumping through the thick forest and a bit closer to the group of chimps. As I slowed down, I could start to make out figures of the chimps above me. Then there was an almighty crash to my right. Three metres away, a chimpanzee was sat staring right into my eyes. Naturally, the chimp got bored and scuttled off. The rest of the group got down to where I was standing and all five of us were immersed in a chimp colony about 15 strong. We sat for about ten minutes with our hearts in our mouths as we watched them building their nests for the night. The largest male, Brutus, was chest-beating and whooping, filling the forest with sound, to tell the others where to settle up for the night. Another big male was a few metres to the left of Brutus, standing up in a partially-made nest weaving branches in and out to complete the bed. They looked so human-like and we could have sat there for hours but darkness was setting in and the guide was getting agitated. Our drive back was fairly uneventful. There were a number of reasons why I couldn’t sleep on the journey; the Ugandan roads, the elephants and baboons out of the window, the smashed buswindow with added breeze and I was still buzzing after seeing the chimps. We stopped in a town to gorge on pringles and fruit juice before getting back to the lodge at roughly eight PM. Arriving back at the lodge always transports me to the pages of The Beach- everyone is sat around laughing and they come up to ask how your trip was. I felt like taking orders of tobacco and batteries for the next trip to Ko Pha Ngan. 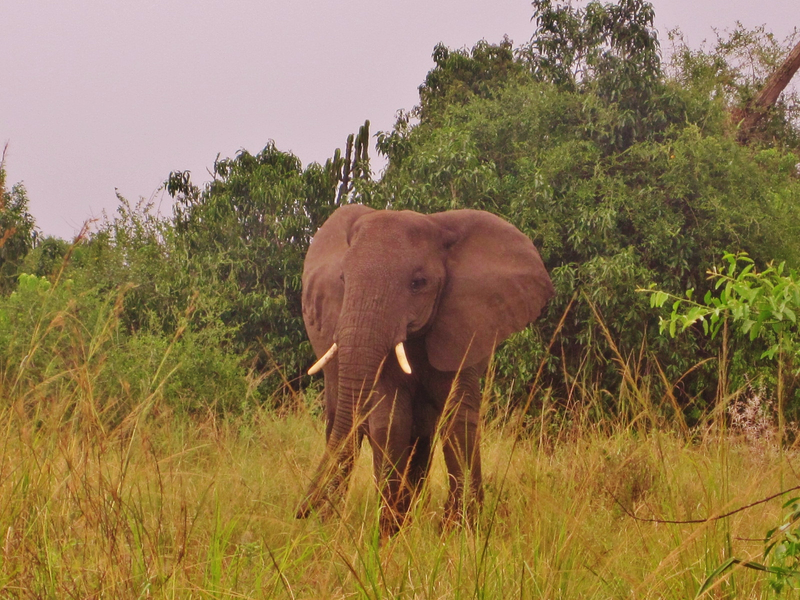 I’ll be blogging my diary from Uganda retrospectively so please come back for more insights into my psyche! If you would like to sponsor my Amsterdam marathon effort (got it in 3 hours 23 mins), please visit http://uk.virginmoneygiving.com/TomGreenwood with all going to Volunteer Uganda’s amazing work- www.volunteeruganda.org. This entry was posted in Uncategorized on November 2, 2012 by tomgreenwood1. 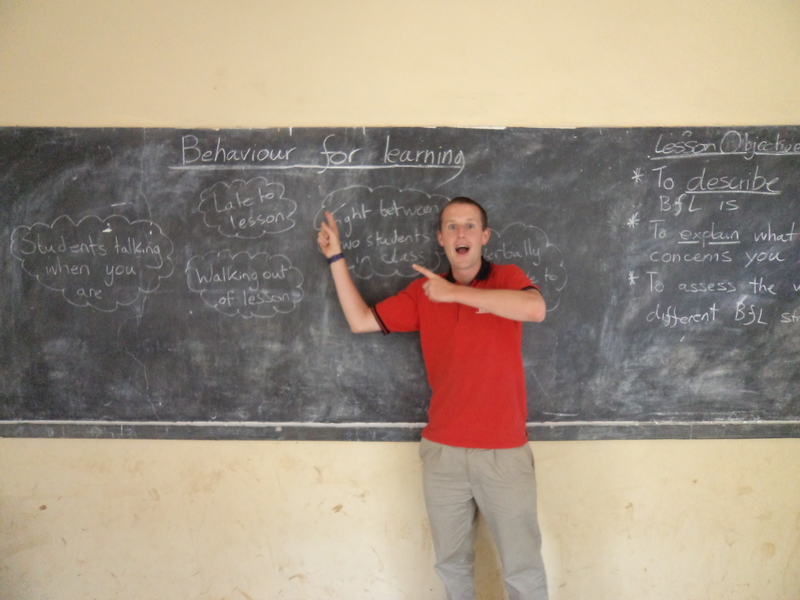 Thursday 16th August 2012- The days I learnt how to teach. All the Teach Firsters have just finished the first week of the Limited Resource Teacher Training. I spent the past two days teaching behaviour for learning, engagement and higher thinking skills with Alex and Peter. We absolutely smashed every session. The teachers loved it and the feedback has all been very positive. I have learnt so much, some from the Ugandan teachers and a lot from Alex and Peter. The teachers were so similar to the Ugandan students in that they constantly wander in and out of class for no reason and talk through what you are saying. After talking to them about this, we have learnt that both of these things are cultural and not misbehaviour as we had thought. So far, the record has been three babies in one class, two breastfeeding and one having a nap on the floor. The third session today was a reflection session and the teachers came up with a bunch of questions along with a postcard of promises for themselves. Our groups at Kirima primary school then walked down to Great Lakes college for the closing ceremony. Simon whipped out another cracking speech then we took it in turns to hand out certificates to our groups. After more speeches by the education minister, our group leader Sam and Simon, we took a huge group photo in the shape of LRTT. Some of the volunteers stayed for a football match but I didn’t want to out-skill anyone so I opted for a run home with Claire. I really enjoy running here with the uneven terrain and unrelenting heat and humidity. Now we are waiting for a birthday party for Morag and Liz then a weekend of safaaaaaari! This entry was posted in Uncategorized on October 19, 2012 by tomgreenwood1. Wednesday 15th August 2012- Huge, hairy gorillas! So I’ve learnt how to spell gorilla. I also had an awesome day trying to find them. We set off at 5.30 AM from the hostel. The two hour drive led us into the Impenetrable Forest National Park and to a short briefing meeting given by lots of AK-47 wielding park rangers. They checked our permits with less rigor than I imagined as our ones had the names of two random Italian tourists on, then we drove to the start of the trail. There were eight of us in our tracking group including a few booby-traps: an old American couple and a young lady who had just had an ankle operation so we weren’t quite sure why she had opted for a day of Mountain Gorilla tracking. They were struggling on the way down the first hill and had to hire porters to pull them along the trail. After the downhill, there was a scenic river walk and we saw a pygmy family who had been relocated from their ancestral lives inside the forest. The government are trying to persuade them to settle by giving them livestock to tend and crops to harvest but it seems like an easy way of losing a unique culture. The forest was bordered by a river so we crossed over and started the first uphill. This was very steep terrain made excruciating by a slow pace and so many pauses by the booby-traps. At the top, the views out of the forest were incredible. The jungle opened out into swathes of oversized stinging nettles and random trees. We stopped to enjoy the view and this gave Andy the chance to try to befriend our security guard in the valiant attempt to get a cheeky picture with the AK-47. He wasn’t relenting that easily. We took a detour off the main track into the jungle following a small path that the trackers had hacked open earlier in the day. We followed a valley along, our footsteps falling next to the ginormous imprints made by the feet of the forest elephants. At four hours into the trek, we found the trackers who had been communicating to us by radio. We dropped our bags. Two minutes later, we were stood behind a clearing starring the biggest silverback in the group right in the face. He seemed so unfazed by us with our clicky cameras whilst he tucked into any leaves he could reach. The trackers kept making noises to reassure the gorillas as they could recognise each of the tracker’s noises and faces. Then the big guy sat up, beat his chest and strolled past the group within centimetres of us. We ran/scrambled after him with the trackers showing us where to go and when to stop to get the best views and pictures. In the end we were stood in the middle of at least seven of them; three kids playing about doing tumble rolls down the hill, the oldest female, two black backs and the big silverback from before. We sat/stood/fell with the gorillas for about an hour then we moved on and stopped for lunch. At this point the whole group was knackered so Andy and I were given the chance of a private guide to make a speedier get-a-way out of the forest. We were properly racing up and down the hills and on the final hill I was trying to outpace the guide who said he was exhausted by the time we reached the buses. 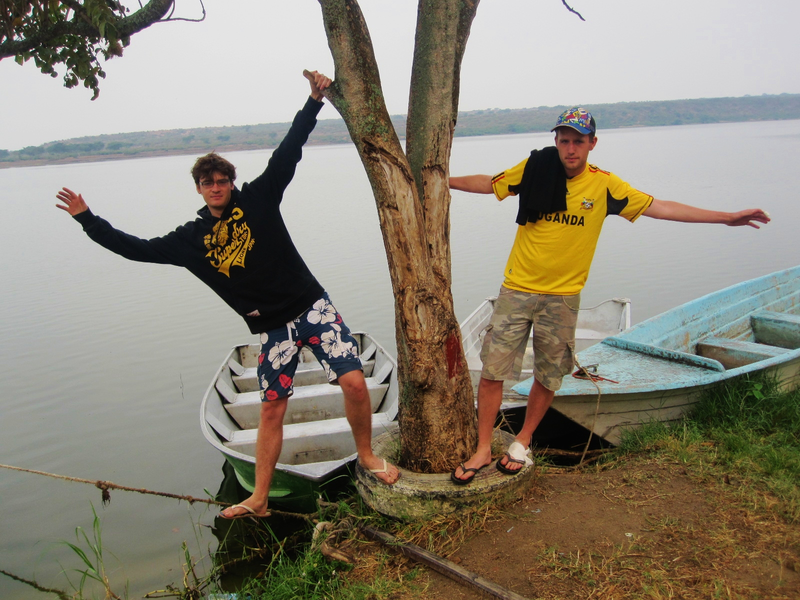 I’ll be blogging my diary from Uganda retrospectively so please come back for more insights into my psyche! If you would like to sponsor me to run the Amsterdam marathon next summer, please visit http://uk.virginmoneygiving.com/TomGreenwood with all going to Volunteer Uganda’s amazing work- www.volunteeruganda.org. This entry was posted in Uncategorized on October 17, 2012 by tomgreenwood1. Monday 13th August 2012 (later)- Training teachers after a year of Teach First?! Today was the start of our Limited Resource Teacher Training Sessions. I was really nervous, excited and daunted at the prospect of running sessions for teachers who could be my grandparents. We set off at eight AM heading for the college that Volunteer Uganda have set up. By 9.30 AM, 150 teachers had arrived from all over the region and we were excited to get started. Simon delivered a captivating opening speech about teachers being rainmakers then we split into groups. Our group were based a 15 minute walk away at Kirima Parents primary school because there was not enough space for the whole course at Great Lakes college. Our first session was mainly name games and for everyone to think about why they were attending. The teachers were quite reticent to start with and we ended up teaching them like we taught the kids. Lunch was pretty horrendous; rice, beans and maize stodge called posho. After lunch we delivered sessions on engagement and group work that both went really well and the teachers seemed to take a lot from them. Once the ice was broken, some strong characters came through; a really memorable guy called Brian who taught me a lot more than I taught him. I was in a teaching group with Holly, Beth, Alex and Peter who all seem like very good teachers. Peter’s grasp of group work is incredible and I’m definitely going to be using this in my lessons next year. Thankfully, the blackboards in the classrooms that we were using are good compared to the worn out grey ones at Great Lakes secondary. The only challenges were the culture of walking out of the classroom to stand outside starring into the sky and constant breast-feeding by the mums with babies in the group. Chris had a hilarious encounter with the breast-feeding that ended in him running out of his classroom in embarrassment. The sessions ended at 3.30 PM then I was whisked back to the lodge for the experience of a life-time- Gorrilla tracking. After we packed our things, I got in a bus with a volunteer called Andy (Insanity Andy) and we were driven to Kisoro, a town almost on the border with Rwanda. We are now staying the night in a lovely hostel waiting for the early start and full on day tomorrow. This entry was posted in Uncategorized on October 14, 2012 by tomgreenwood1. The Lake Bunyoni weekend was brilliant. We had a lazy morning on the Saturday then hired some dug-out canoes for the afternoon. Another volunteer, Peter, and I commandeered one of them and paddled out to see how big the lake really was. On the paddle out we spotted lots of hanging birds’ nests then this dropped back to give way to spectacular views of the huge lake surrounded by hills and volcanoes. We sat in the middle of the lake and spotted an otter making dive after dive, only coming up to lay on its back and eat its catch of crayfish. We played a few hilarious games after they had gone then went for a midnight swim that ended in lots of broken glass and impromptu surgeons performing glass extractions from feet. Early on Sunday, a few of us had decided to take a visit to the orphanage so we motored across from the island then trekked up a hill at the edge of the lake. The steepness of the climb up the hill seemed strange until I turned around and realised I was walking out of a volcano crater. At the top were a few classrooms, a few tourists and lots of singing and dancing orphans. The classrooms were really well decorated and we spent some time reading to the kids and talking to the lady who runs the whole thing. The children loved us reading their books but needed a lot of persuasion to start making animal noises at the appropriate times. These orphans were the poorest I had seen from their lack of shoes, hygiene and clothes and it was such a contradiction to have this orphanage only a short distance from a well-developed resort for tourists down by the lake. I was glad we had come up to visit but left feeling overwhelmed with the task that the lady had started to tackle. She has decided to send all of her teachers to our teacher training sessions next week so it is great to have made that connection and add some more context to where these teachers are coming from. When we arrived back at the lake, we packed our things and headed for the buses. Driving back from the lake was fairly smooth as long as you were on the right bus. One of them broke down in Kabale and they ended up reaching the lodge at two AM instead of eight PM like the rest of us. I’m starting to wonder if we have a mole in our group who brings incredibly bad transportation luck or if this kind of thing is commonplace in Uganda. This entry was posted in Uncategorized on October 11, 2012 by tomgreenwood1. Enter your email address to follow this blog and receive an email when I post my next diary update!